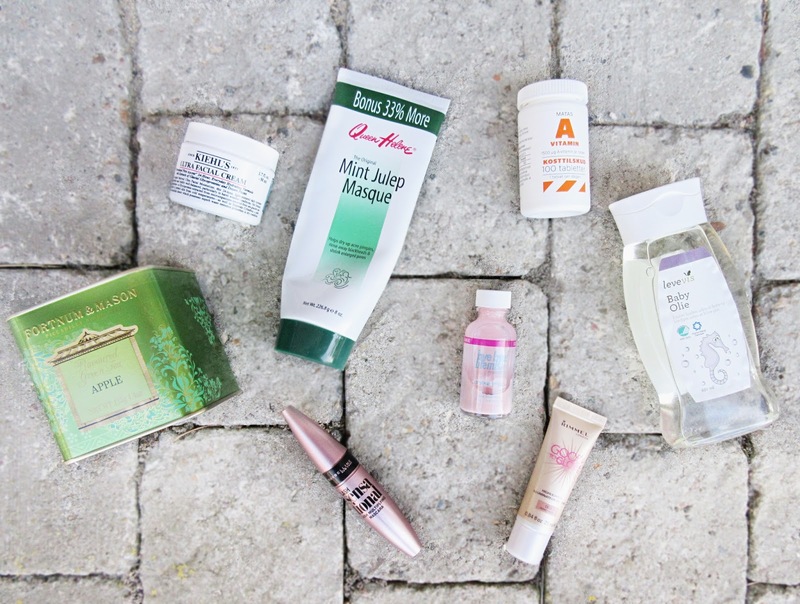 It's been a long time since I have talked about some of my new favorites, so here's a quick review of all these products. I was so lucky to receive this from my parents, after their trip to London. This loose tea tastes SOOO GOOOD. Never tried green tea with apple, but I love the fresh apple kick it adds to the green tea. Green tea can to some people taste a little boring and it's not the most delicious of teas, but if you are a new green tea drinker, try this! I got a sample of this moisturizer and I'm usually not the type to ever use the samples, but since Kiehl's skincare has a special place in my heart, I gave this moisturizer a chance and ended up loving it so much, I had the buy the full size. It's very hydrating, can be used for both mornings and evenings and doesn't leave your skin so greasy that you'll have to let it sink in for 30 minutes. A oldie, but a goodie. I first used this 3 years ago and loved it for clearing my skin, when I got breakouts. Then came the GlamGlow phase... But I used this mask again during September and fell in love again. You definitely don't need the expensive GlamGlow masks to destress your skin. I LOVE THS MASCARA. If you want full and long lashes like I do, this is such a great mascara. Normally I have to use 2 different mascaras to get the look I want, but this one gets it all done. I just use two coats with it. This is my new "quick-pimple-fix-product". It's alcohol and come kind of pimple curing clay, and the two liquids separate when you leave the product without shaking it. DON'T SHAKE IT! Then you dip a clean q-tip through the clear liquid and into the clay at the bottom of the bottle and dot the clay into your zits. Then the zit dry up and disappear within a few days. GENIUS. I have the longest acne skin story in all the history and was on Accutane 2 times (harsh acne medicine) which didn't cure it completely. Accutane contains a high amount of vitamin A, therefore I thought I would try taking a vitamin A supplement to prevent my breakouts and it works! Even recommended my best friend to try it and it works for her too. Definitely try it out if you feel like nothing else works. I use a very matte foundation, and it's just a bit too matte, therefore I bought this bronzy colored highlighter to apply under my foundation, to make up for the crazy matteness. Love it! This is the most affective and cheap body moisturizer I have ever used and even though it's an oil, it doesn't leave your skin greasy like a lot of other products. I have no idea how it works, but it's amazing and leaves your skin crazy soft, no wonder why babies have soft skin! Let me know if you try any of these items and how you like them!